My daughter is 10. And I assumed she still believed in Santa because she hadn't said anything stating otherwise. But when I made a comment like, "Maybe Santa will bring it for you," when she asked for a toy, she sighed and went, "I know the truth about Santa and the elf. I’ve known for two years now but you seemed to want me to still believe, so I pretended." I was a little sad that she no longer believed, but I knew it was coming. But. But. There was good news that came with her announcement. I asked, my voice shaking with excitement: "Can we get rid of the elf then?" Look, I think the elf is a fun idea for kids. But it's irritating for parents who don't want to move it around on a daily basis. 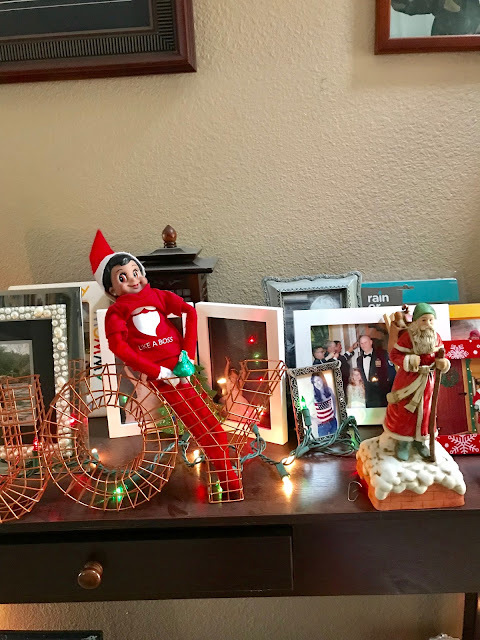 And some parents have these elaborate set ups, and the kids see those set ups and wonder why their elf is just sitting on top of a lamp and it's just...it's just not enjoyable for me. At all. Some parents love it. But me? No. "Can I help?" Tommy asked. He's a teenager and when the elf first arrived, he actually believed it. He was weirded out though and would ask questions like, "But how does this fake looking thing report back to Santa?" I knew he wouldn't be sad to see her go either. Natalie shrugged. "Sure. I don't need the elf anymore." So I grabbed the elf, and prepared to punt her. 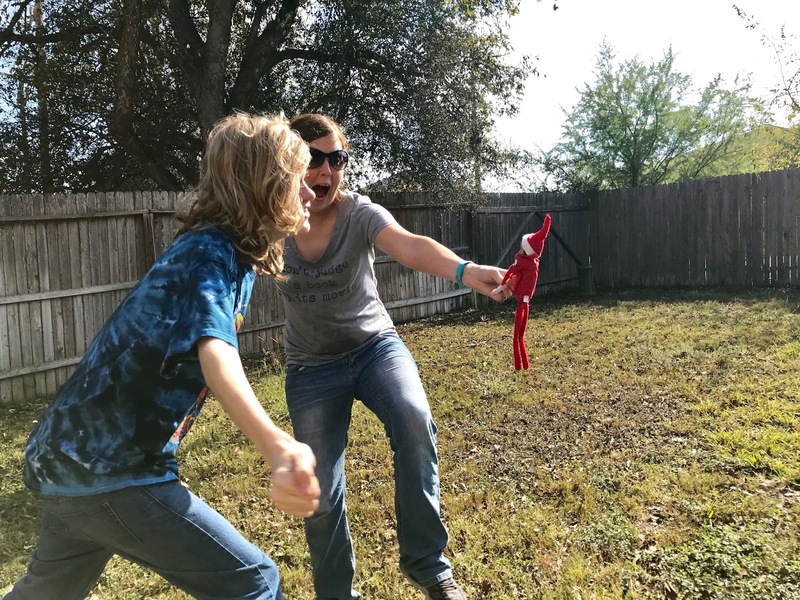 Then Natalie was all, after seeing her elf flail around in the air, "Don't hurt her! Can you still move her around? Not every day, but for old times' sake?" And at first I was going to say, "Uh no, she'll sit on a shelf and remain there, because that is what her box says she does." But then I saw Natalie as a little girl who believed in Santa and the elf on the shelf that we named Meredith for Meredith Grey on Grey's Anatomy. And I sighed and went, "Sure sweetie. Once in a while she will move. For old times' sake." Omgosh I will miss your cute Elf posts!! 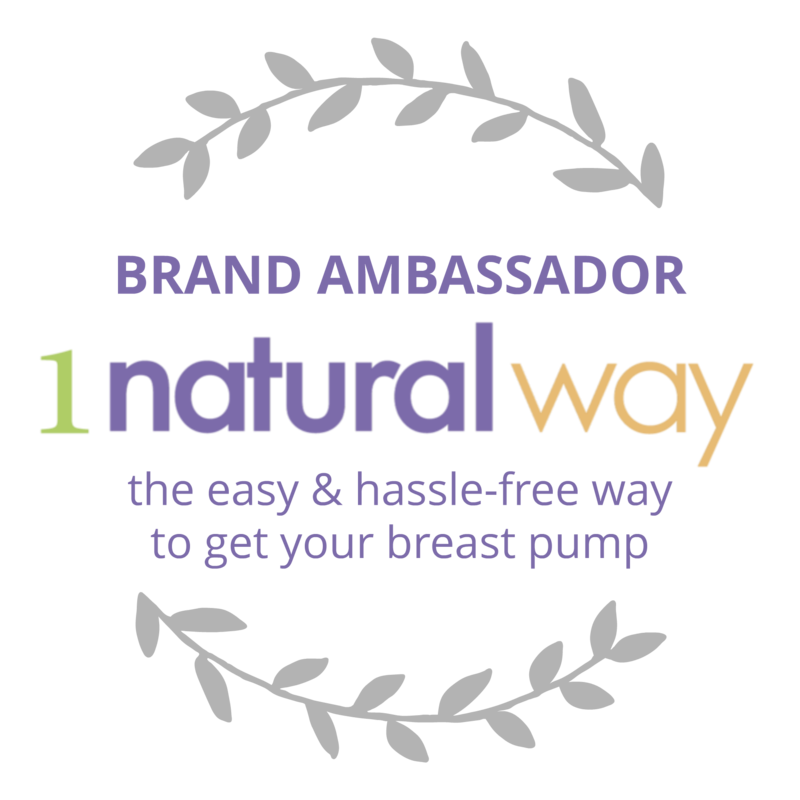 Come on Natalie, let's keep the spirit alive!! LOL! We've never gotten an elf because I'm afraid I'd want to do exactly what you did -- punt it! I do not need more work to do at Christmastime. Sad that the magic is gone, but glad you have one less thing to worry about! It looks like you had fun kicking that elf around! I can see why you'd want to! oh my gosh these are just the cutest. 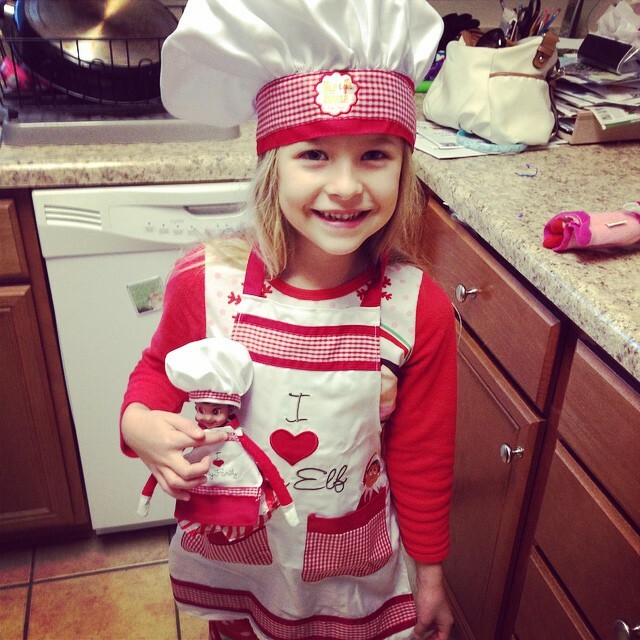 I love the matching chef outfits for elf and your little girl! I am gonna honestly ugly cry when my daughter no longer believes. She's 12...and before you think she knows the truth....we homeschool her. She isn't around any kids that know the truth! The kids she's around in our homeschool group, they all believe...they all have elves, and it's gonna be a sad sad day. Christmas is no longer the same when the magic is gone. My oldest is 18, and therefore she has aged out of Santa gifts...(aged out since my 12 year old gets gifts from Santa) And it's just sad. She has gifts under the tree that she never used to have. She told me the other day that Christmas morning won't be the same...coming in to the living room, and not seeing gifts wrapped for her from "Santa". Oh my gosh you all look like SUCH a fun family! I would totally do the same thing with my Elf on the Shelf if we had it! You totally cracked me up! Ahahah she is so smart! And so nice too! Pretending to believe in santa. What a cool kid! My daughter knows the elf is not real probably because she's sensable. I haven't brought the elf out this year and she wants him out just to watch his antics. She even had fun moving him around too. My daughter and I were discussing the Elf and decided we were totally over the red guy. Good by to the Elf and onto something else. 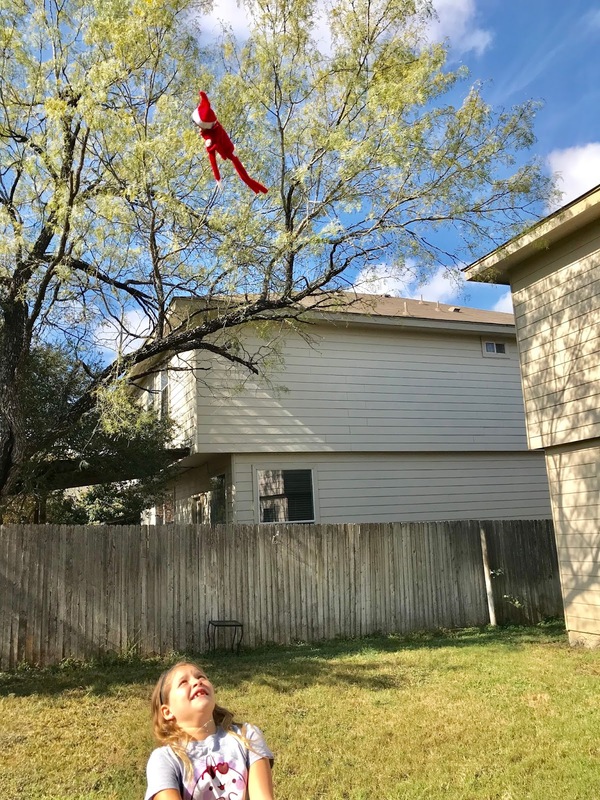 We didn't do the elf on the shelf this year for my ganddaughter. She is too young to expect it, and I am saving my time. 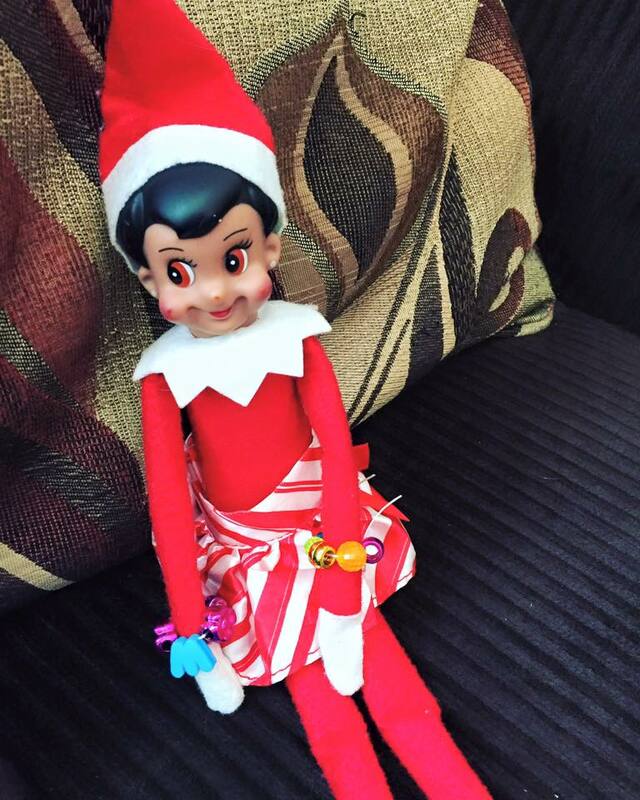 I love how elf on the shelf is keeping your kids in the holiday spirit! It is sad when they figure it out about Santa! 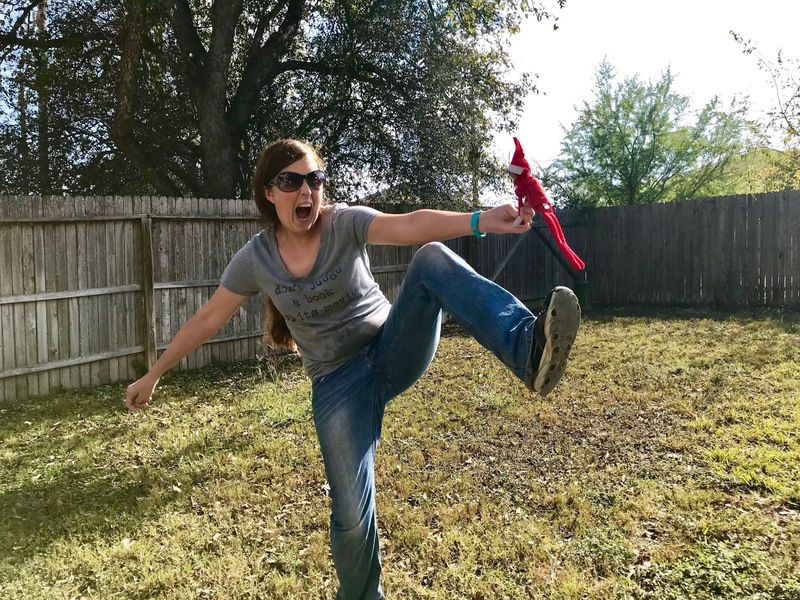 I am dying laughing at your photos of you preparing to punt the elf!!! Even more so at your teenage son still kind of believing!!! I would love to hang with y’all! I’ve never done elf on the shelf, and I have a 2 year old now, but I know I’d be so lazy about it. 😩 I saw One today where they created a leg cast for the elf to explain why he wouldn’t be moving. 😬 Thanks for the laughs! I am so glad my kids haven't gotten into the elf and hope it stays that way! I don't want to move it and find it kind of creepy. Oh that is so cute, I have to admit I don't know how parents manage to come up with all these ideas and keep it up! I guess at least you only have to move a little. The elf did go through a lot now. It's sad that she knows about Santa this early but for sure she'll still enjoy the holidays. I think it's nice to have a few old traditions even when the kids are older. We've never done the Elf on the Shelf stuff! I love seeing the different family holiday traditions. 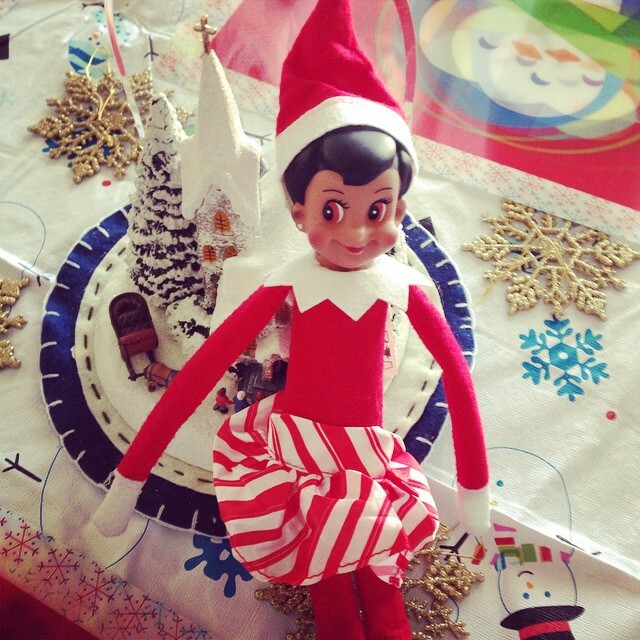 These are some adorable photos of your elf on a shelf. We usually do a advent calendar with scripture readings. Love involving the kids in the holiday preparations. I love that you named your elf Meredith in honor of Grey's Anatomy. We named ours Gibbs in honor of NCIS. I must admit that it can be tiresome, but all of us have fun with our Elf on the Shelf. OMG! What a cute story. I have never gotten into elf on the shelf, it's way too much work. It all seems so fun!I love the matching outfits! Haha I love how you tell what happened. I grew up believing Santa gives gift to good kids and that we need to sleep early because He will not give gifts to kids awake in the midnight. Lol. Elf has now a new role in your family though. We don't have that Elf on the Shelf thing. We did - ONCE. But if freaked out the kids so it went bye-bye the next day. Anyway, we raised our kids to believe that Santa is a saint, and that he represents the virtue of kindness and giving. But my kids knew early on that Christmas is all about the birth of Christ, which is the reason for the joy and happiness around. My son is 12 and as sad as I could be, he doesn't believe in Santa anymore. Elf on a shelf is something we never did at home. I have not been one to get into the elf thing, but it is cute. I think I would have kicked the heck out of it too. Your family is adorable. Ha! She is going to be 30 and bringing her kids over for Christmas and you are still going to have to move the elf around. There is no escape! D'awww. I have grown up with Meredith too. Sob. 10 was the age I was too. I'm glad she still wants the elf around! I am literally LOLing! You punted the elf on the shelf I am not a parent but I told myself I wouldnt participate in Elf on the shelfing...I dont like it. Wait...the elf is a SHE? I have seen this elf do some pretty amazing things...thank you Facebook...but I never grew up with this tradition. It looks like fun, though. Enjoyed the pictures of the family. Bunch of characters I see. So it is goodbye to the elf, but sure she will move a bit for old time's sake! Kids nowadays are much smarter than the earlier generations and know a lot. The elf on the shelf looks cute. It’s the perfect Christmas decor. I am not sure if Elf was introduced to us when I was younger. However, Christmas is fun because we are complete! Family gatherings happen during this season. Good to know that you decided to still keep it, though now as what your daughter want. Oh my! This is so cute and cool! I love the elf and you daughter kitchen outfit, they look so adorable! It is so great that she is still nostalgic for at least part of the tradition even though she knows the "truth". Keep it alive as long as you can mom! Awww. You know what, only this year I figured out what the heck this whole Elf in a Shelf was about. HAHA I'm a bit slow..! 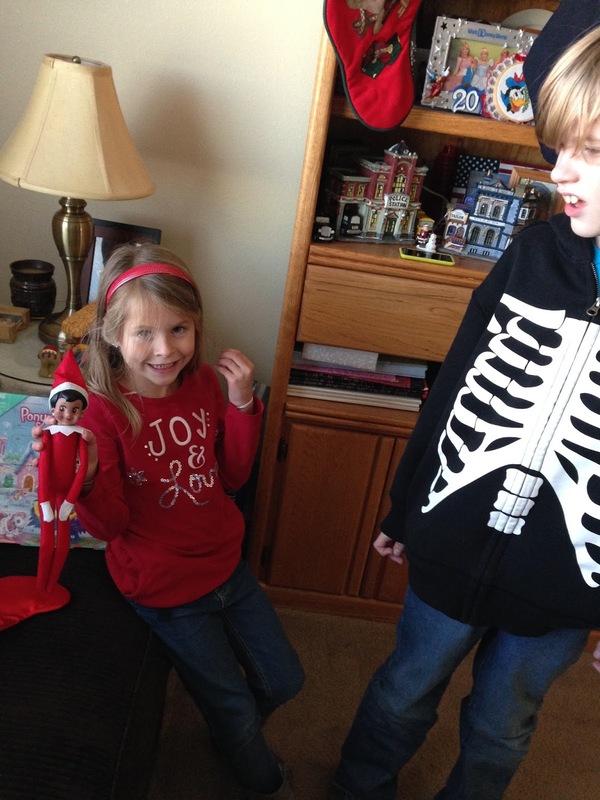 My 9 year old grandson figured it all out this year (Elf, Santa & Tooth Fairy - all at once!) and I admit I'm kinda sad. His two older brothers actually helped move the elf every night so there was that at least. It's always a bitter sweet transition when they kids grow up more and more. I understand your excitement about getting rid of Elf on the Shelf. That thing is creepy. Kids do grow up and lose some of those childlike qualities we love. I have never had the Elf game but it does look like a lot of fun for kids. Aww this adorable - sometimes it's fun to just do little things. Do you think your still be moving about the elf this year? Too cute. Funny how we start traditions and then the kids kind of grow out of them so we switch it up. I don't even know where our Elf on the Shelf is. He's been gone for years. We still do elf on the self, but my girls are younger. I can definitely see the desire to continue the tradition, even if it can be annoying. While I know my oldest doesn't believe (she's actually the one that moves it now), my two youngest jump out of bed every morning to go find her. I can't imagine ending that tradition. 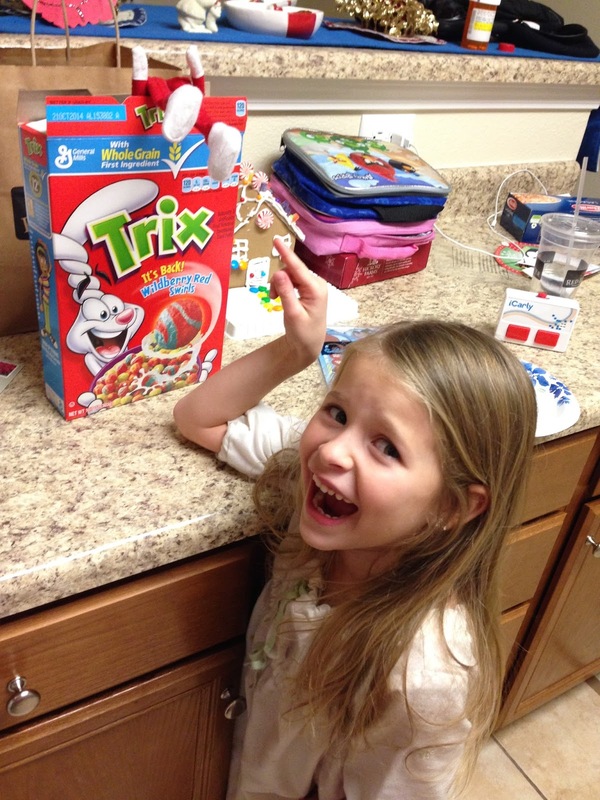 We, thankfully, haven't had to get into Elf on the Shelf for my daughter. I'm not looking forward to other kids letting her know about it. When I was a principal, I did Elf on the Shelf for my students! We had a naming contest and little prizes for found her first. It was fun! While I don't always look forward to being responsible for the Elf, I agree with you. And it's really a short period of time where we are doing these kinds of things. I remind myself that it is short-lived and the memories we are making. We still haven't gotten an elf for my daughter... But we are considering it next year. This year She's seen the elf everywhere - at school and her friends house - and she asks why we don't have one. Awwwww, this is so sweet. I love it. My daughter still believes and I am holding on to it as long as I can. Kids nowadays didn't normally believe on what we believe back then. Natalie is so sweet, she's growing up too fast and I hope you can still keep it with her.